theodore ushev » Against the Bulgarian Mafia, rip off the bastards! Against the Bulgarian Mafia, rip off the bastards! Here, I should post information about my retrospective, and workshops in Spain. 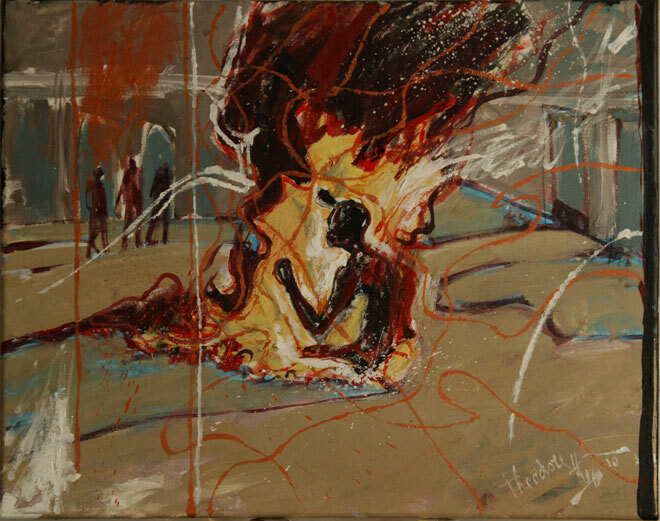 But recent events in Bulgaria, just made my cry, and I just want to post this painting, from my Lipsett 2010 exhibition. Today I dedicate it to the memory of 36-year-old Plamen Goranov who self-immolated in the city of Varna, protesting against the Bulgarian Mafia in February and who died on Sunday. The fight continues, my friends. Rip them off!